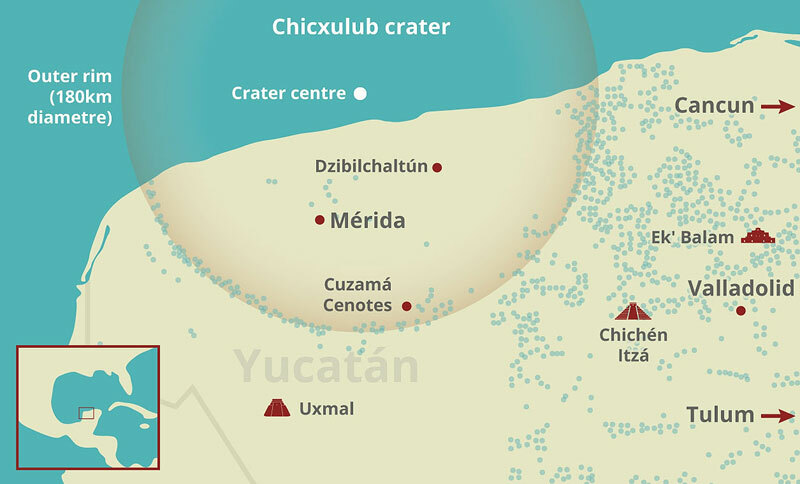 In the late 1970's two geophysicists searching for oil on the Yucatan peninsula discovered the remnants of a huge crater near the small town of Chicxulub on the north edge of the Yucatan. Through further research and analysis it was concluded that this 180 kilometre wide crater was a highly likely candidate for the mass extinction of the dinosaurs and the end of the age of reptiles some 65 million years ago. Well good riddance! And bring on the Mammals! The beginning of everything as we know it. Fast forward an eon or two and I arrive in Yucatan. 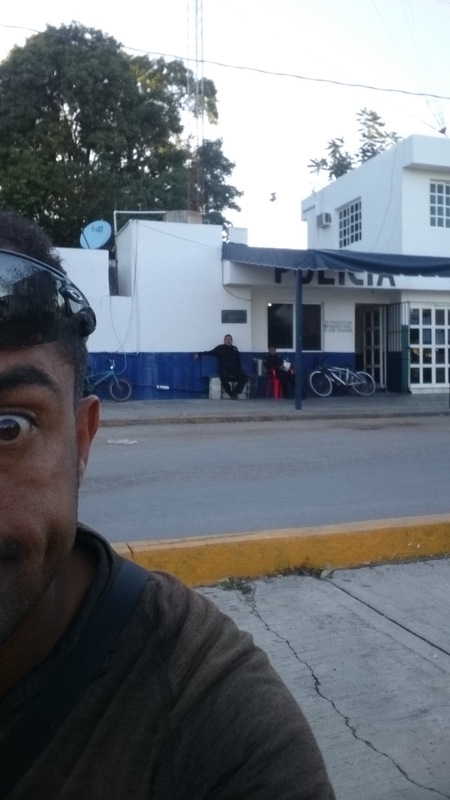 Charlotte took the night bus from Campeche to Playa del Carmen to meet her friend and I continued the following morning, into the headwind to a small village called Manxcanu. A cheap $120 peso, mosquito filled room and I hunted for food and flyspray. I returned, showered then filled the room with chemicals as I quickly left and shut the door..
A cheap dinner of the ubiquitous street tacos with pork and shredded vegetables. Often dull, these were much improved because the tortillas were hand made on this occasion and I returned about 45 minutes later to find a giant cockroach having a death fit on the floor of my room. I despatched it quickly and kicked it outside. I slept well, but despite the spraying, some Mossies survived and sucked the blood from my arms. Merida was a short 45 km's further up the road and I took a long slow morning to pedal the final distance to my contact, Célida at Casa Catherwood in the historic centre. Frederick Catherwood was a 19th century artist, explorer and architect who meticulously sketched many of the ruined structures of the Maya Americas and explored the region extensively. His house has been extensively restored and is now part gallery of his work and part restaurant and health spa. It is a very tranquil location and a great place to eat. Amanda the chef prepared some great food and the following day the lovely Célida managed to unravel 8 months of knots in my tired muscles with a wonderful back massage. I stayed with Farina and her partner Octavio, friends of Célida. In their house in the north of the city and though I originally planned to only stay 2 nights, I was more or less immediately invited to stay longer as they were all part of a local cycling club who were planning a camping/cycling weekend to visit some local archaeological sites amongst other things. Well it seemed too good an opportunity to miss, so naturally I agreed. I didn't realise we would be heading more or less back to Manxcanu as that area was actually quite rich in Maya ruins, Cenotes, the famous clear water sinkholes. Grutas, the subterranean cave complexes and lots of excellent tracks and trails for mountain biking. WHY oh WHY isn't the local authority making more effort to more obviously promote this?! It turns out the route I took into Merida, passes many of these Cenotes and Grutas, but the signs on the roadside are derelict, nondescript and do nothing to promote the hidden treasures in the region. I would have stopped had I realised. We rode as a small group of five to Chen-ha. A small cenote close to Chochola. And like many Cenotes, on the boundary with the Chicxulub crater. It was a great location for camping and very peaceful despite the road being only 100 or so metres away. About 30 cyclists, kids and various other friends had arrived the day before and pitched their tents. Shortly after our arrival they set off on their next ride. We didn't join them as we were tired so spent the afternoon relaxing in the shade of the trees and swimming in the cenote. Apparently there were crocodiles in this one. But they were rarely spotted and only about 1 metre long. Still, enough to do some damage but the only reptile I saw was a very large snake gliding from one bank to another later in the afternoon. The following day a vote was taken by the group and we set off to visit nearby Oxkintok and its Maya ruins. The terrain in this area is predominantly flat being only 10-20 metres above sea level. The group quickly split up into groups showing the stronger and weaker riders. But it was nice to see that there were regular stops to allow the slower riders to catch up. Not something you see too often with some groups. My bike rides surprisingly well off road and I surprised many who thought I might struggle. But a history of cycling, mountainbiking and a now much lighter pannier free bike, I was actually enjoying the challenge of offroad singletrack in Mexican forests...on a recumbent! The day was long. Too much for some people and although I was mentally prepared to ride the 45 kms back to Merida, we were offered a lift and managed to squeeze our bikes onto a pickup. The next couple of days I spent exploring Merida and some of the many galleries, museums and parks there. The city seems to manage the balance between quite busy, yet very relaxed very well. Sitting in one of the many parks watching the world go by and drinking street Horchata you can see this is a very busy place, but nobody seems too stressed. Given more time I would have loved to stay longer and discover more about the city. The lovely Girls in Casa Catherwood were quite busy with their various little projects. Amanda invited me to eat there again and served a fantastic roasted Salmon and crab sauce one day and an excellent roast chicken the next. Célida busy with clients and Farina organising a Yoga class. Other friends and clients popped in and out and I felt very welcome in their little social group. The Mundo Maya museum to the north of the city is a huge and imposing building housing many significant archaeological finds from the Maya era and the history pre dating that. However, the layout is terrible. And the exhibition is disappointingly small. While fascinating, you pass through well presented, but badly labelled rooms quite quickly and are ushered to the exit by the security guards in a way that suggests there is more, but actually you are now back on the street again. A disappointing morning was made better by a trip to Progreso beach with Farina and Célida (also located almost dead centre of the dinosaur crater). I didn't want to leave Merida and as I pedalled the next morning to the 180 road east, I tried to justify staying a couple more days to enjoy it more. I kept moving though and arrived in Pisté that evening. I found a cheap hostel, a hot shower, food and sleep. I needed sleep, I was aching more than usual for some reason. Charlotte had recommended visiting Chichen-Itza. This is very well restored Mayan complex with the 36m tall 'El Castillo' pyramid in the centre. You used to be able to climb up it, but apparently there were too many overweight tourists having heart problems as they climbed in the hot sun. I spent a brief 1.5 hours walking around listening to the guides talking to their various tour guests and getting harassed by the sellers trying desperately to sell you their souvenirs. It was an impressive location spoiled only by too many tourists and aggressive sellers. It would have been great to come back in the evening or on a closed day and just walk around alone. About 10 km's after leaving Pisté, a car pulled up alongside of me as I was riding. 4 big surly guys inside trying to flag me down and stop me. I panicked a little of course. What did they want? "Hey stop! We want to talk to you?!" "Hey where have you come from? Pull over please!" "We want to take a photograph"
What options did I have? Ignore them? They could follow me for hours. Or just drive me off the road. I didn't have much choice. No other traffic approaching, thick forest either side of me. I told them to go ahead and park and I would catch them up. I stopped, thought about my options. They didn't seem aggressive. Even turning round they could still follow me in the car. There were no side roads, and I was mid way between towns. I pulled my bear spray from its holder and into my pocket and made sure my knife was easily accessible, just in case. I slowly rolled up to meet them. The car parked off the road in between the trees. One guy grinning, leaning on the bonnet. Another guy urinating at the back and the driver and his friend running across the road to meet me. Smiling enthusiastically. I shivered, took a deep breath and so began the assault..... of standard questions. "8 months are you crazy?!" "Did you hear this guy?!" He called to his friend at the back of the car. "Hey Idiot, Come take a photo!" He rushed round to the back of me and grabbed my shoulder! I grabbed the trigger of the Bear spray! "Whiskeeeey" he shouted the standard response in Mexican spanish to having a photo taken. "Take more idiot, you don't see bikes like this everyday!" They swapped and took more photos. Surrounded me. I smiled nervously, waiting for a crack round the head, a push or a punch and these tough looking guys to do their worst. But no. They looked curiously, poked my bike asked questions and took photos. After a minute or two of what seemed like an eternity, they shook my hand, wished me well and jumped back into their car, shouting comments like " How cool?" "Amazing" and so on. They sped off with horn blaring. Once my heart restarted and the fog cleared and I realised they were slightly overenthusiastic locals like any others I had met. I started to calm down and breathe normally again. I put away the bear spray, took a deep breath and kept pedalling. By the time I reached Valladolid, I was exhausted. I think I must have picked up a mild bug and my body felt like I had run a marathon. Given the fact I had actually cycled more than two that morning alone, was irrelevant, I was very tired. I checked into the hostel and slept for a couple of hours. And spent a very dazed hour in the afternoon wandering the very pretty city looking for food. One mediocre steak later, I felt better but still tired. I received a message from Célida who was passing through Valladolid the following day, to visit a friend. I just relaxed for the rest of the day. Célida arrived and feeling much better, we immediately visited Ek' Balam north of the city. This is another significant Maya structure but in a more 'natural' condition. Smaller, derelict and with only a tiny percentage of the tourists. It was great to wander around and climb all over the pyramids. After which, we shared a meal in a local restaurant with the local speciality of smoked pork. I added this to my list of best meals on the journey so far, and certainly one of the best in Mexico. Which itself is a challenge as the food here is pretty good for the most part. The long straight flat slightly boring road continued but became more interesting as there were a lot more Cenotes along this section and I realised I was more or less riding the rim of the crater. The road following a slight curve to the north. On to Leona Vicario and my first camp in a while at the local police station. The officer in charge, I am sure, was trying to test me and kept asking various political questions about the state of the economy in Europe and which currency is used in England. Why he didn't just ask to see my passport I don't know?! He suggested camping in the bandstand in the park opposite. I wasn't keen. It was a very noisy focal point for the locals and I knew immediately it would be noisy into the night. 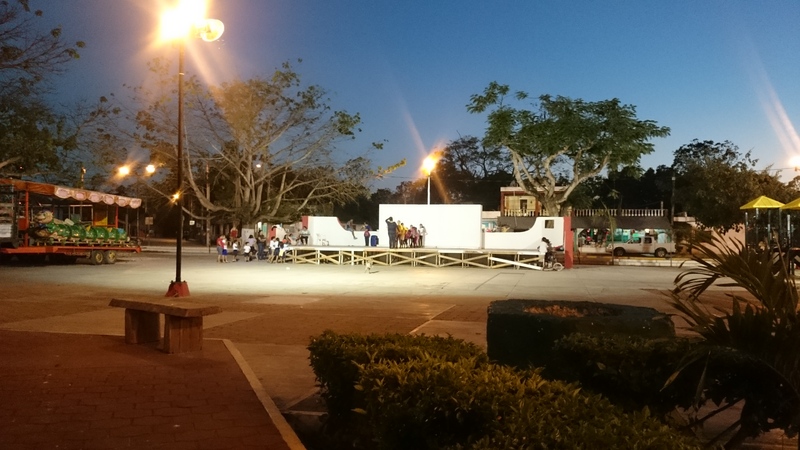 Some girls practicing a dance routine, guys playing basketball, Motorbikes racing round the square and the rest of the teen population sitting in the bandstand using the free Wifi to check their Facebook page. I would not sleep there! After an hour I asked to put my tent in the back of the police car park. "Yes if you like, but it's a bit quiet there, and dirty"
After clearing a few leaves I set my tent up on the flat concrete. Arriving the next day in Playa del Carmen was a shock. Of course it is a very popular tourist town with amazing beaches and scenery. I was looking forward to a few days rest here to do some admin and enjoy the beach. I contacted Pablo, my Warmshowers host and he guided me to his little flat. What a disappointment! Despite many positive reviews and Pablos generosity and enthusiasm, the flat was not what I was expecting at all. The place was a mess. Dirt and filth everywhere. Ants crawling over the food stained tables. Flies all over the dirty plates and food scraps in the kitchen. The Bathroom drain blocked, smelling and a dangerously wired electric shower which tripped the fuse breaker every time you switched it on. I took a much hated cold shower. Pablo is a property investor from Mexico city and purchased this as a second home at the beach because he also suffers from Asthma but I cannot imagine the dirt and unhygienic conditions would be doing his health any good. And I had visions of food poisoning amongst other things if I stayed there. I don't expect luxury every time and I could have managed if I were staying for one night. But I wanted to stay for 3-4 nights and this was just not a place to relax. I cleaned and bleached some floor space, set up my bed and made an escape plan. The easiest would be a hostel or hotel. But in this expensive town?! Again, maybe for a night, but not for multiple days. I put out an emergency request to the other Warmshowers hosts. In the mean time, Charlotte had returned from her travels, and so we met for a quick drink, tacos and a catch up chat. It was great to see her again, but she was still on the move and left town next day to continue her travels. Later in the evening, Javier responded to my panic message and invited me to his home just a short distance from where I arrived. It was nice to find a place to relax, and be able to organise things (and update blog pages!) etc. Javier and his girlfriend Clara were kind enough to host me at short notice then promptly invited me to a barbeque with their other housemate Norman. And so here I am, being stared at by two of their three dogs and eating delicious Mangos which are now in season. I have had time to mail some things home, do laundry, enjoy the beach, sushi, steak and generally relax. Most importantly though, I have had the time to read up on my next country. 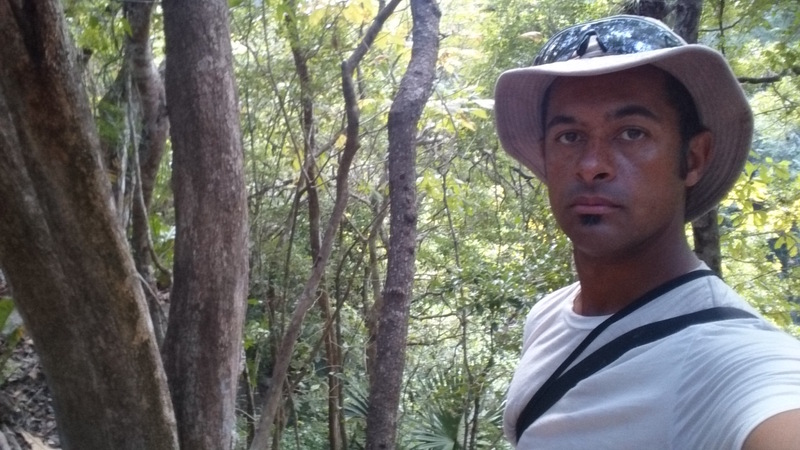 I have heard more negative things than positive about Belize, but as seems to be the way, it is all outdated information from someone who was never there or heard from a friend. I was told the same about Mexico and have had a great time here. While one should never dismiss the dangers that no doubt exist, one should also temper them with fact. My episode with the guys on the forest road certainly reminded me of that, but it shows that first impressions are not always as they seem and I still believe that people on the whole are good. Mexico has proven that with out a shadow of doubt. It is a fantastic country, and I will definitely be coming back to visit and explore more. Once again, I have met some amazing, special and generally very lovely people here who have become buenos amigos. Muchas gracias a todos para su hospedaje, amistad y su ayuda en todo el pais. Espero que nos encontramos en futuro y tambien cuando regreso nos vemos. Some time in the next week or so, I will cross the border at Chetumal into Belize. I hope the bad things are not true but as a good friend quoted recently. If I don't go, I will never know.